The Church of St. Simon-by-the-Sea was built in 1889, on land donated by Frederick W. Downer, the founder of Mantoloking, a Presbyterian. 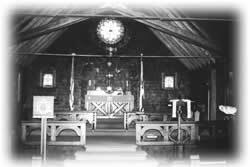 The Church became an Episcopal Church because the first minister, the Reverend Dr. Bishop, was an Episcopalian. It originally seated eighty people and is believed to be a copy of a Norwegian fisherman’s church. The church was enlarged to its present size, seating one hundred and fifty around 1897. In 1907, Mrs. Frederick W. Downer gave the property and furnished rectory to the Church. The railroad tracks, on the west side of the Church, were removed in 1949. After that, the railroad property reverted to the Downers, the original landowners. In 1952, Lisa Downer, the daughter of Frederick W. Downer, gave the land west of the church and rectory to the church. In 1983 a Memorial Garden was designed and created on the south side of the Church for the interment of ashes. The rededication of the Church of St. Simon-by-the-Sea was held on August 1, 1999. This service celebrated the raising of the church onto a new foundation and the dedication of the cross on the eastern steeple, in memory of John P. Benedict. The church of St. Simon’s has several interesting features. 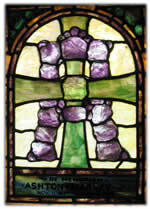 The Tiffany oculus window above the altar is in memory of the Reverend Dr. Horace Bishop, the first minister. The lamp which hangs in the chancel came from Nuremberg, Germany and was given by Mrs. Frederick W. Downer. Mrs. Downer also gave the cherub-heads over the altar and throughout the Church, which were made by a wood carver in Chemnitz, Germany. The baptismal shell was found at Fulton Street Fish Market in New York City and given by Sadie Randolph, a member of the choir. The lectern is a hand-carved anchor, which Mrs. Downer gave in memory of her husband, Frederick W. Downer, who loved Mantoloking and the Church. The bell, which the children have rung every Sunday since 1916, was given by Mrs. William Simonds in memory of her husband. In the winter of 2001, the bell was completely renovated by the de Camp family in memory of Janet de Camp. The needlepoint kneelers in the chancel and sanctuary were stitched by many women of the church under the direction of Mrs. Joseph S. Lovering and were dedicated in 1972. 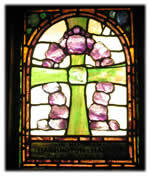 The church has many memorials to former parishioners which add a special warmth to the history of St. Simon-by-the-Sea.